The smallest bedroom we decided to make into a bunk room. Sean was unimpressed with the quality of the IKEA bunks I had planned on buying but we were able to find two high quality sets of pre-owned bunks for under $300. Curtains are $9 IKEA panels, hemmed. Metal animal wall mounts are from Hobby Lobby, standing lamp is via craigslist and bedding is from Target. Night stand was .99 at Goodwill, prettied up with yellow spray paint and the vintage framed fabric panel was also found at Goodwill for $2. We left the ceiling fan for use of its light but disabled the fan sine it hung a little too close for comfort to the top bunks. On our next trip down we'll try to raise it higher into the peak of the room. 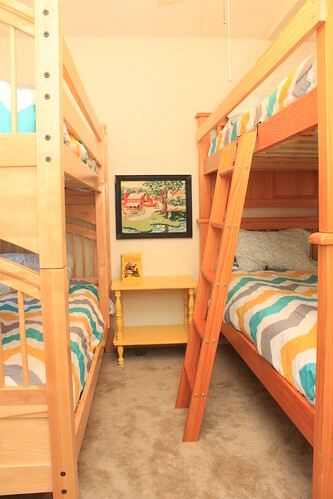 And there you have it, the fun bunk room in the Florida house! Ha! That reminds me! 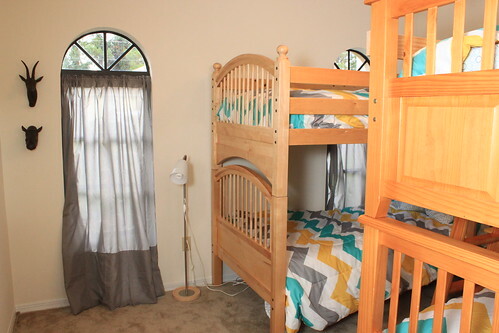 When I was in my younger teens I had bunk beds in my teeny tiny bedroom and there was a ceiling fan. I can't tell you how many times I biffed my head on a moving fan either climbing into bed or sitting up in bed in the morning. Try waking up in the middle of the night to go the bathroom and WHAM! 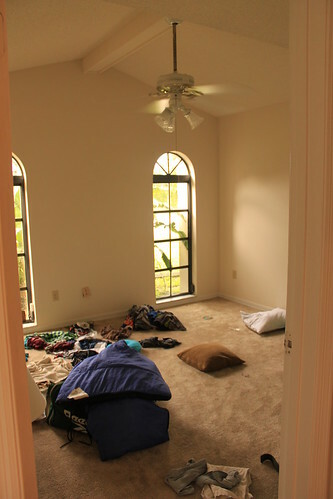 Your beach house is amazing. I hope you do a pool/jacuzzi/patio tour too because I got a glimpse the other day and was left salivating all day long!